Barbara Newman reintroduces English-speaking readers to an extraordinary and gifted figure of the twelfth-century renaissance. Hildegard of Bingen (1098-1179) was mystic and writer, musician and preacher, abbess and scientist who used symbolic theology to explore the meaning of her gender within the divine scheme of things. With a new preface, bibliography, and discography, Sister of Wisdom is a landmark book in women's studies, and it will also be welcomed by readers in religion and history. Barbara Newman is Associate Professor of English at Northwestern University. 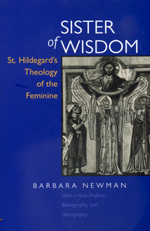 "This is simply the best book ever done on St. Hildegard in English—a well-conceptualized work of remarkable erudition and vigorous style. Medievalists will love it, and it will generate debate in the field. "—Robert I. Burns, S. J.